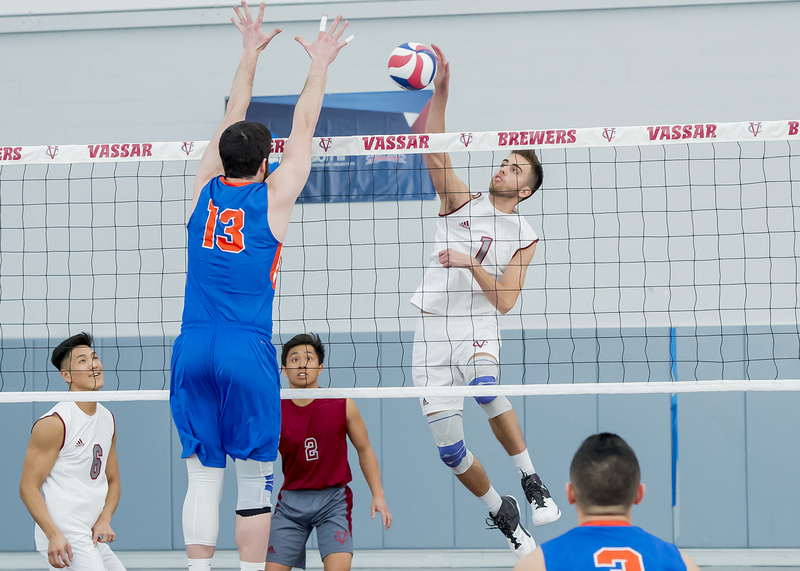 It was a clean sweep for the the men’s volleyball team this past weekend, as they handled both Bard College and Elmira College at Kenyon Hall. The number-10 Brewers faced the number-15 Elmira College Soaring Eagles on Friday, March 30 and took home the victory in a thrilling five-set match, with scores 20-25, 25-21, 20-25, 28-26 and 15-10. In their next match, the Brewers easily bested Bard in three straight sets. This description of Elmira turned out to be incredibly accurate, as the Brewers found themselves in the middle of a battle from the moment they set foot on the court. Before they knew it, VC was down two sets to one, having lost the first and third set, but they fought hard in the fourth set to force the match to a fifth set. Losing the first set has become an unfortunate tendency for the Brewers, and this weekend was no exception. Against Elmira, Vassar struggled out the gate with six service errors and four aces against them. Overall, the volleyball team has lost the opening set in three of their last four matches. However, the Brewers did not give up and came back strong in the second set, with a few service errors in favor of Vassar and a key kill from sophomore Kevin Ros that allowed the Brewers to take the set. The third set was another challenging one, with 11 attacking errors that allowed Elmira to go up 2-1. Vassar bounced back for the fourth set, however, and with late kills from senior Matt Knigge, Ros and first-year Ryan Duchemin. The match was now all knotted up, 2-2. In the fifth set, VC hit 0.350 with no errors. Knigge led the team with four kills to secure the thrilling five-set win for the Brewers. The key for the Brewers’ victory was limiting Elmira’s offense in the later sets of the match. In the first three sets, Elmira hit over .270, but Vassar crushed that hitting percentage down to 0.65 in the fourth set and 0.120 in the fifth set. On Saturday, the Brewers extended their winning streak to nine straight games with a 3-0 victory over Bard College. VC finished 8-1 in their conference, tying Stevens for the top spot in the conference. Five Brewers posted five kills or more. First-year Wesley Olstad posted eight on the day, and sophomores Zach Bygall, Ghali Khalil and Ros each posted six. Vassar dominated the Bard Raptors in every category. The Brewers hit .206 on the day compared to a -0.025 from Bard. VC posted 38 kills, 32 assists and only 18 errors while Bard put up 20 kills, 22 assists and 23 errors. Senior captain Knigge, a two-time All-American player who leads the team with 360 kills, has been an exceptional offensive force for the Brewers in his time on the team. Although Knigge was proud of the team for coming up with a five-set win against Elmira this past weekend, he is primarily focused on what lies ahead. “I think we have our work cut out for us as far as winning our conference tournament and showing well in the NCAA tournament is concerned,” Knigge explained. He thinks that in order to do this, the team must be consistent throughout the rest of the season. The Brewers have three guaranteed matches left this season before they enter league play and hopefully NCAA tournament play, where Knigge and the rest of the team is hoping to take home volleyball’s crowning jewel.